With the punctual arrival of UEX 1374 in Hamburg-Altona, the Urlaubs-Express has successfully completed its second winter season on the morning of 24 March. On the 22 traffic days since the end of December, the UEX has taken around 4000 passengers on their winter holidays and back. 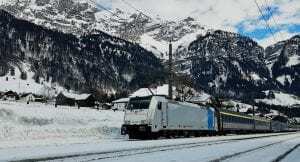 The UEX winter motorail trains transported around 600 cars to and from Munich. While passenger numbers in January remained the same as in the previous year, the 2018/2019 winter season saw a remarkable increase of 20 percent for February and March. As in the previous year, the punctuality rate was 96 percent. In addition to the extension from the original Landeck-Zams destination to St. Anton, the Winter UEX once again scored well with passengers thanks to its comfortable club cars and friendly crews. “We are very pleased that our winter offer has established itself so well and that we are able to convince more and more guests of the advantages of travelling on the UEX night train to their winter holiday with great destinations and good service. Our guests do not only save one overnight stay per direction and arrive rested in the morning in the skiing area. By using the most environmentally friendly means of mass transport, they also make a direct contribution to climate protection,” says Train4you Managing Director Niko Maedge. The UEX team thanks the passengers for their confidence and says “Goodbye” – on one of our summer trains or in winter traffic 2019/20. These can already be booked from mid-April, as always with the Urlaubs-Express with attractive destinations at top prices for early bookers. The exact date of the booking start will be announced in good time in the Urlaubs-Express Newsletter, for which you can register here.